This buyer’s guide provides a dealer perspective on the factors important to selecting a website provider. A good website will match your needs and enhance your store’s digital marketing initiatives. Use this guide, in conjunction with product and user reviews on the www.Drivingsales.com Vendor Ratings website, to structure a high-quality and objective product evaluation process that cuts through the noise and creates a short list of potential partners. The search for a new website entails more than just the selection of the technology provider. An understanding of the modern Internet consumer’s shopping behavior, along with a thoroughly developed dealership business strategy, are essential to making the correct website selection for your dealership. Today’s websites are sophisticated marketing and commerce tools that need to represent your brand while delivering a seamless and transparent shopping experience to the end consumer. Executing an engaging and dynamic web strategy is challenging and requires a systematic inward analysis of dealership procedures and policies to ensure it supports the desires of today’s buyers. Your website “is” your dealership (more so than the physical storefront) and how it conveys your brand promise, displays content, and functions represents your brand to today’s internet savvy shopper. Selecting a provider that can execute your companies vision and business model are critical to a successful website. Plan for your search by looking at your current site, what worked, what didn’t. Research competitors’ sites and look outside the industry at leading web retailers for best practices. Outline goals and objectives for your new site that are critical success factors. Most importantly understand who you are building your website for… your customer. In an effort to ensure that this buyer’s guide paints a complete picture of the website selection process, a comprehensive discussion around dealership business strategy and website technology platforms will be reviewed while keeping the perspective of the Internet consumer front and center. Building your brand and telling your story – Internet consumers are no different than the traditional shoppers in that they are both looking to build a long-term relationship with the companies they choose to do business with and are seeking to find companies that share similar values. Take the time to build a cohesive brand message that resonates through everything that your business does from dealership interactions, to ease of web-based services, down to community involvement. Consumers are looking for companies that execute on what they state and are eager to engage with businesses with whom they can identify. Embracing third-party sites – Consumers are going to utilize the “whole” Internet, not just your site. Embrace the information that consumers can glean from these sites and understand how to use it to your advantage. Integrate items such as third-party testimonials, product information and independent dealership ratings. Design proactive policies and procedures that allow your personnel to constructively engage with today’s well-informed consumers. Personalizing – Engage with you customers on a one-to-one basis. Ensure that your sites are utilizing the latest in Internet referral data and cookies to deliver messages and shopping experiences that resonate with the user. Stay on top of social pages and create blogs that users can subscribe to and follow. Most importantly, execute on what you state you will. Disconnected experiences based on expectations set on the web and dropped at the store will undermine your business objectives sooner than any price quote on a vehicle. Data integration – This topic has been a common theme and has been discussed in our CRM and DMS buyer’s guides as well, but its importance simply cannot be understated. The ability for your dealership to meet and exceed customer expectations as they relate to the Internet, dealership interactions, and retention activities hinge on your technology solutions integrating and sharing data. Upwards of 70% of today’s consumers expect to engage with the dealership on their chosen platform4, highlighting the need for streamlined data and uniform customer records throughout the dealership. When considering business goals and a future website provider, ensure that technology integration between your website, DMS and CRM systems is always in the forefront. In many cases it may be advantageous to consult or hire independent technology specialists to help decipher and integrate prospective technology solutions. Invest in your people – Most, if not all, of your dealership employees have a cell phone and use the Internet, but that does not necessarily translate into a full understanding of how to best utilize the technology or engage with consumers. Developing a customer-focused culture requires communication and constant maintenance. Invest in your personnel, as they are your most valuable assets when delivering consistently on your brand promise. Promote a culture that recognizes and rewards learning by associates and ensure that everyone receives the training necessary to perform at the highest level. Consumers transitioning into the dealership are armed with troves of data from third-party sites as well as the dealer site; having staff ready to seamlessly pick up the shopping experience in the dealership will cater directly to the expectations of today’s consumer. A final thought as it relates to business strategy: today’s consumer expects that you will execute on the items discussed in this section. Consumers’ everyday interactions with companies and services outside of the automotive industry help reaffirm this expectation and raise the bar of customer service daily. Failing to deliver on your brand promise and/or providing seamless customer handling will result in the customer becoming frustrated and simply not returning to your store. Consider this statistic: 9 out of 10 consumers expect to receive a consistent experience over multiple channels.5 Customer expectations have risen to a point where not implementing a comprehensive multi-dimensional business strategy in today’s marketplace simply is not an option. As vehicles have evolved over the years from small block V8, chrome-clad machines sporting fins to sophisticated hybrid- electric vehicles with advance computer technology, the dealership has evolved as well. Technology drives everything that happens in store, from diagnosing and servicing vehicles, to communicating with customers during and after the purchase. When researching website providers, it is important to understand that the dealership of today operates in an “integrated dealership model”; dealership technology solutions are required to communicate and pass information between associates, departments and, in some cases, physical locations to quickly and accurately assist a customer. 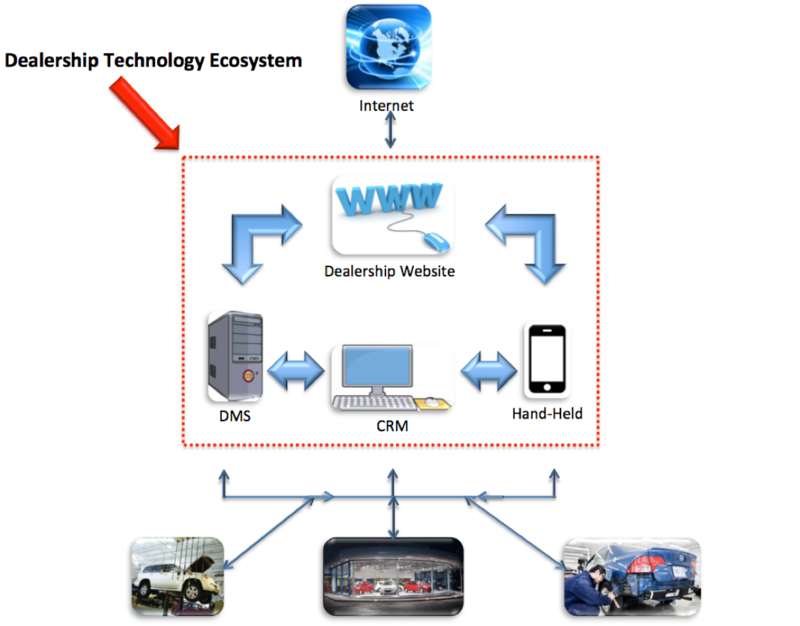 The diagram below illustrates the website’s importance to the overall dealership technology ecosystem. Your website serves as a gatekeeper to the Internet by taking in such information as leads, service appointments, and collecting consumer shopping insights and passing them off to your in-store technology solutions (CRM, DMS and Handheld Solutions). The existing dealership technology solutions can (in most cases) utilize this data to match lead information with historical spending patterns, shopping frequency and ownership information to present a complete picture of the active consumer. New Price Sensitive Shopper (never purchased at the dealership) – This consumer is looking for a specific vehicle and shopping multiple sites to find pricing and equipment information to finalize a purchase decision. By using DMS and website technology in tandem, the dealership can define website pricing rules that look at gross profit, days in stock and current inventory levels from the DMS. Combine this valuable information with vehicle search and frequency information from the website and you can offer solid pricing and current incentive information on vehicles of interest. Loyal Dealership Customer – This consumer has purchased multiple vehicles from the dealership and returns regularly for service. The consumer submits a request for a quote on a new vehicle through the dealership website. Utilizing integration between the DMS, CRM and website, a custom quote can be generated which acknowledges the customer’s loyalty and provides a personalized experience. A poorly integrated website limits the connectivity between the existing technology solutions and in turn, reduces your overall visibility to the customer. As you map out prospective website providers, pay particular attention to integration points both within their own products as well as third party solutions. The integrated dealership technology model for most dealerships will be constructed over time and will not be complete with the purchase of a new website. Understanding how your existing technology solutions drive your customer engagement strategies will help ensure that future integration capabilities are considered. The website products offered in the automotive industry are sophisticated and for the most part, very high quality platforms that provide the dealership with outstanding functionality. That said, different capabilities and support services will resonate differently with each individual dealership based on what is most important to their business goals. The checklist outlined below contains key foundational items that every dealership should take into consideration when shopping for their next website provider. Each organization will utilize the features to varying degrees based on business needs; careful consideration should be given when a provider does not meet minimum functionality in each of the following items. Responsive design allows the website to automatically size its layout based on the detected screen size of the user’s device. With this technology, there is no reason to have separate mobile device websites with there own URLs and site maintenance requirements. Responsive design combines maintenance and system update functionality, allowing updates through a single unified backend module. This technology not only streamlines maintenance, it also improves site performance and continuity for the end user. The items outlined below highlight key elements of responsive design and demonstrate why this is the most important foundational element of your next website. One Website to Manage – Responsive design offers the dealership the ability to mange their entire web presence in one location using one set of tools. This makes maintenance easier as you can update inventory pricing, page specific content and much more, a single time for all devices. Many of the websites will even mange pictures and assets dynamically, requiring only one image to be uploaded to the site’s backend tool so that the site can size the asset correctly across the platform. Most page editing tools allow the user the ability to see exactly what each page will look like on a desktop, tablet and mobile device. Supporting the Multi-Device User – Today’s Internet-savvy customer uses four digital devices up to 60 hours per week with 55% of that usage coming on mobile platforms.6 Websites must be mobile- friendly to be relevant, as consumers simply will not return to sites that don’t perform well on their device of choice. Recent studies have found that almost half (48%) of users interviewed attributed poor mobile-device performance to the business “simply not caring”.7 In addition, most users will return to a site on a different device than they originally began their research; continuity in design and saved searches/data are critical to a solid website. Selecting a website that provides an optimized mobile experience is simply a requirement in today’s world. Make sure you access and evaluate the mobile experiences from any provider you are considering from both smartphones and tablets. Improved SEO Rankings – The mobile-friendly, single URL design of responsive sites conforms to the latest in search engine ranking logic used by the leading search engine providers. Google began utilizing “mobile-friendly” as a ranking differentiator and in April of 2015, adopted a formal methodology for rewarding mobile-friendly sites that are built for multi-device support. Having a great site that nobody finds defeats the purpose of having the site… responsive design help overcome this issue. Future Scalability – Responsive site design is fluid and while not guaranteeing compatibility with every new technological creation, it provides a solid foundation to allow for future devices and screen sizes. The physical design of your website, and the content contained within the site, is what your user wants to interact with and understand. Sites that do not conform to the latest navigation/search techniques utilize the very latest content formats (video, testimonials, imagery) or convey an easily digestible engaging experience, will not resonate with the end customer. Your website is your brand and needs to convey everything you stand for while making information readily available to your user. The items outlined below highlight key considerations when selecting a partner to help design your site. Design Methodology – The provider you select to supply your website needs to be thought of as a design consultant and not just a technology provider. Once you are comfortable with the technology aspect of the provider’s product, you must ensure that the provider has the design capabilities to execute your site. Confirm that the provider has a written design methodology that outlines the site design process and allows plenty of opportunity to review the site in a test environment before it goes live. Many providers will host your new site on a development based URL with restricted access to allow live testing of the site as it is developed. In addition, most providers will create custom content for your site unique from other sites they host. This content is a critical element in making your site unique, but in addition, will also help your SEO position by referencing and tagging the content. Personalization – Today’s Internet shopper is inundated with information and keeping it all straight can be difficult. Content personalization has become increasingly relevant in engaging consumers and ensuring your brand and site break through the clutter. Many of the site providers offer personalization to different degrees. The very best sites offer dynamic homepages that can change the content and messaging based not only on interaction within your site, but also on referral data gleaned form third-party and OEM sites the customer may have visited. Targeting features such as Geo-fencing take customer personalization to the highest levels of sophistication by allowing personalized offers based on location/interest. Geo-location can allow for dynamic website content changes on mobile devices based on current location. Your website will play a critical role throughout every function in your dealership - from the sales and service departments to marketing and lead generation activities, the site will touch almost every aspect of the store’s daily operation. Easy to use reporting and administration tools that provide simple site maintenance and actionable data are as important, if not more, than the outward customer facing website itself. Google Analytics (GA) integration to measure SEO, Keyword, PPC campaigns performance, and augment lead data. Real-time lead tracking by department source, contact method, and device. Site tracking capabilities that will display the percent of views for key items such as vehicle models shown, audience size viewing the segment and detailed trend analysis. Automated monthly reports that give a comprehensive overview of site performance can be scheduled and delivered via emailed to appropriate contacts. In many cases Digital Performance Advisors will help review the document and design go-forward strategies for the following month. Some vendors provide complete click-path tracking to measure user interaction both on the site and before they arrived at the site. This helps to evaluate different market segments and campaign performance– valuable functionality not available from GA alone. Dynamic drag-and-drop page editing capabilities. Utilizing simple WYSIWYG functionality, users can update or create a page in minutes. With preview options (and in some instances content link and Meta tag checks) built into the editor, website changes and configuration updates can be performed in-house without the need for support intervention. Widget administration and plug-in management directly from the management tool makes the management of items such as YouTube content easy. Responsive content preview that allows the page to display what it will look like on multiple devices simply by dragging the corner of your browser and resizing the image. Site audit functionality that provides grading of your site’s performance against similar sites in the provider’s portfolio. Many of these tools provide suggestions for site optimization that will improve performance. Specials, incentives and coupon creation can be accomplished in most backend tools with functionality to specify items such as vehicle, customer, vehicle group and automated expiration dates. A/B testing and heatmaps that allow dealerships to understand what is working with their site and what is not. In A/B testing, certain providers will even go as far as automatically splitting traffic between the test and live page to conduct testing. Third-Party and Provider Supplied Plug-ins – Providers offer optional components which support dozens of different plug-ins. These plug-ins range from chat tools and inventory integration, to complex lifecycle marketing programs that integrate DMS data and digital media to create personalized one-to-one interactions. Work with the providers you are researching to understand exactly how their site and supported offerings can be leveraged to meet your business goals. DMS Integration – Whether the website provider supplies a DMS as part of the company’s offerings or integrates with leading providers, it is important to understand how and what information can be used between the two systems. Some can provide true allocation of lead and ROI based on DMS sales data. More complex DMS integrations can use the data to help personalize messaging and drive relevance to the user both while shopping and while in the retention cycle. CRM Integration – Integration between the website and the CRM tool inside your store is becoming more commonplace. Many providers offer lead integration and click-path tracking with leading CRM products. A handful of providers take it a step further and even provide alert notifications when a user has actively reengaged with the store’s website. This allows BDC or sales representatives the opportunity to build personalized messaging and offers based on what the user has actively viewed and searched across all recent website sessions. OEM Integration – Some providers have tightly integrated their endorsed website platforms with the manufacturer’s advertising and promotional systems. This can be a significant benefit for both the shopper and the dealer as promotions and pricing can be updated in real time without dealer administrative burden. In addition, consumers are guaranteed a consistent message from national advertising to the dealer, increasing sales conversion from manufacturer advertising investment. Optional components and platform specific plug-ins may not be top of mind when shopping for your new website, as the site itself can be a complex enough decision. That said, it is important to understand the provider’s additional product offerings and third-party plug-in support, as they will impact expandability down the road. Most of the modern websites on the market today support many leading plug-ins for items such as inventory integration, chat tool, and PPC advertising initiatives; certain website providers develop with underlying products that are more compatible than others. In addition, some providers prefer to integrate plug-ins that are coded using the same development tools as their sites. In most cases they will have a component that fits the requirements you are looking to solve, but it may not be the brand name tool you preferred. Vehicle Configurators – Similar to OEM websites, allowing customers to build and price their desired vehicle. Payment Calculators – Compare finance and lease payments side-by-side using actual interest rates, residuals and incentives. Credit Pre-Approval – Soft-pull credit applications provide real-time credit information without the need for the consumer’s social security number. Process Automation – Sales and service processes ranging from deal structure to virtual service consultants are available to guide customers through complex processes. Digital Advertising Integration – Integrated marketing campaigns that use website engagement and response data in conjunction with results from digital marketing efforts (such as banner ads and PPC campaigns) to provide holistic marketing strategies. Lead Source ROI Allocation – Website and DMS integration that combines lead source allocation and vehicle sales data to provide an accurate understanding of lead effectiveness and ROI. A final consideration when looking at optional provider offerings, especially if your dealership does not have a dedicated or in-house advertising/marketing team, is the additional marketing and analytics offerings available. These resources can be beneficial when navigating the world of SEO optimization and PPC campaigns. In addition, most offerings will provide additional site monitoring and analytics reporting to get the most out of the website. Dealership brand and design flexibility – A fundamental tension between the dealer and the OEM is that the OEM wins if a consumer buys from any of their dealers but the dealer only wins if the consumer buys at his/her store. DrivingSales believes that dealers should have a strong dealership “why buy” brand message and their website must provide them the flexibility to communicate this in addition to the OEM-brand aligned messaging the consumers expect. Fortunately, in the past few years most manufacturers have generally provided dealers more flexibility on design and messaging within their endorsed programs, but dealers need to evaluate any restrictions imposed on the endorsed platforms by the manufacturer. OEM vs. Dealer Group – If you belong to a group with multiple brands that has made a significant investment in the group’s brand promise and experience over that of an individual manufacturer, you are likely to lean to deploying a common group website platform that will not be endorsed or compliant with all the manufacturers you support. OEM advertising integration – A few manufacturers have made major investments in linking their national and regional advertising and promotional efforts into endorsed website platforms. This can have a significant benefit to dealers as consumers getting consistent messaging across all the sites they visit (OEM, 3rd party and dealer) are demonstrated to convert to sale at a higher rate than if they see conflicting information. Many of these OEMs will only send leads from their national site to an endorsed website platform. They may also buy SEM terms on your behalf that need to be coordinated with your own SEM strategy. If you work with one of these manufacturers, evaluate the benefit of coordinating with and tapping into their advertising efforts. If you are organized to support them adequately, it is a viable strategy for dealers to maintain multiple websites – one being the manufacturer’s endorsed website and the other being a dealership/group branded site outside the manufacturer’s constraints. You just need to evaluate whether the incremental value of having multiple “doors” to your dealership overcomes the administrative and technical complexity of maintaining multiple user experiences. In principle, anyone with the right technical skills can build a website. Some dealers have worked with their creative agencies rather than an automotive website provider to achieve the ultimate in brand customization and experience. As automotive websites have become more complex – supporting responsive web experiences, integrating with manufacturer advertising and promotional initiatives, etc. – dealers should be cautious about going down the 100% custom website path. A very viable alternative scenario is to select an automotive website platform with a high degree of creative flexibility and engage your creative agency to execute the brand experience on that platform. Dedicated Account Manager – A dedicated account manager assisting with the design and implementation of your new site is a fundamental resource that each provider should offer (in some cases it may be at an additional fee). A good account manger should help in coordinating content development, asset collection and provide insight into proper SEO/PPC strategies that will best optimize your site for launch. Coordinating your website development is no small task and having solid project management provided by your vendor will facilitate the process. Custom Content Team – Having a team of writers that can create dealership brand-specific custom content along with vehicle detail pages and community interest stories, will help boost your site’s SEO/SEM performance. In some cases these services may be part of an optional package. Providers may also offer custom video and asset creation to further enhance your site. Having a brand-new website that contains boilerplate content is not something you want to launch and can hinder the site’s SEO performance. Select the website that best suits your business goals, but keep content support in mind when making a final decision. Development/Test Website – A number of providers offer a secure test website location that allows authorized users the ability to test functionality and monitor the design of the site before it launches. This offering speeds the build process, as it allows for dynamic feedback on site effectiveness and design issues in (close to) real-time instead of waiting for the site to launch. In addition, this capability is hosted in a secure location that does not expose your new site to the public. Be leery of the “we can do anything” providers – Today’s website providers do offer a wide variety of functionality and content with their platforms, but be cautious of the providers that state they can do anything. Careful review of a provider’s design and implementation process should provide a fairly clear understanding of what the platform is truly designed to accomplish. Ask the hard questions of your prospective provider; if you do not see something clearly documented, find out “how” they will accomplish the requirements you are requesting. It easy to get caught up in the excitement of the purchase, but take the time to clearly identify functionality that is critical to the success of your site and ensure that the provider supplies you with a level of comfort. Initial website training provided by most of the platform providers tends to focus on the basics of site management and performance evaluation. Ensure that key dealership personnel receive enough training to competently manage the backend tools designed to update and manage the site’s content along with an understanding of key performance red flags. The dealership should come away from training with a core group of staff that is well versed in basic page and site update processes along with the ability to spot SEO/SEM and performance issues that are causing the page to perform poorly. Most providers offer standard call-in product support that can assist with any issues that should arise with the system. In some instances, the providers will offer a limited-time proactive maintenance period that provides monitored support and analytics designed to tweak and configure the site over the first few months. In addition, ongoing online product support and tutorials are available from most providers. Does the dealership have the dedicated resources and expertise to run and maintain a complex website on its own? Standard support is always available, but depending on the complexity of the installation having live site monitoring or additional content creation resources available may provide a valuable backup. Enhanced analytics and site performance monitoring services are provided by most providers and offer robust insights into items such as site traffic statistics, leads sources, ROI, Geo-location targeting and detailed Google Analytics reporting. In addition, optional site performance monitoring services can provide site optimization services that confirm Meta data, page links, and site performance targets are correctly configured and monitored. Though website contracts take on two primary structures, the predominant format is term-based. Some offer month-to-month terms. The fact that term-based contracts are more of the standard in the website market may appear to run in contrast to categories like CRM, where a shift to month-to-month has been prominent. Most provider’s term-based contracts run in 12 month increments and, given the amount of effort that you and the provider will put into making sure the website represents your brand and functions correctly, the overall length of the agreement is not unrealistic. Ensure that the renewal parameters are documented and well understood before finalizing your agreement. Some providers offer alternative contract structures, so discussing all of your options upfront will result in a contract that will work for both parties. Website costs vary depending on the level of complexity and optional features purchased. The typical cost structure is broken down on a per dealership basis with monthly site costs ranging from $1,199.00 for a basic website package to $2,499.00 for more robust offerings that typically include enhanced analytics and website automation features. The average observed monthly website pricing tends to be around $2,000.00 per month, although some manufacturers may provide dealers discounted pricing for endorsed providers. Most website providers charge a one-time setup or configuration fee that is usually equal to one monthly payment. Most manufacturers will allow their dealers to apply co-op dollars to their website costs, at least for endorsed or certified providers. Most website providers offer additional capabilities and product offerings that integrate with their website products. Common functionality includes enhanced SEO, reporting and digital advertising integration. Depending on your requirements, researching these options in tandem with your website purchase is advantageous as certain providers may rise to the top of your consideration list based on optional components and packaged pricing options.